Full of rejuvenating nutrients. 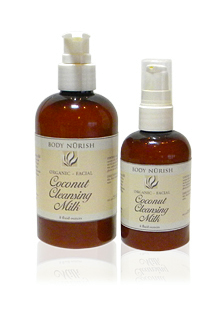 Our soothing milk cleanser removes dirt & impurities without stripping your natural oils. Gentle non-irritating formula for even the most sensitive or dry skin. Ingredients: Organic aloe vera gel, coconut milk, vegetable glycerin, kukui nut oil, coconut oil, vegetable emulsifying wax, xanthan gum, coconut flavoring, glucose & enzyme.